Copenhagen, Denmark - It was an exciting evening at the B&W Hallerne where in front of thousands of people in the arena and millions of people on TV, Conchita Wurst from Austria won the 2014 edition of Europe's Favourite TV Show with the song 'Rise Like A Phoenix'! What an evening it has been!! 26 wonderful acts sang their hearts out on stage, competing for the ultimate prize; the title of winner of the 2014 Eurovision Song Contest. 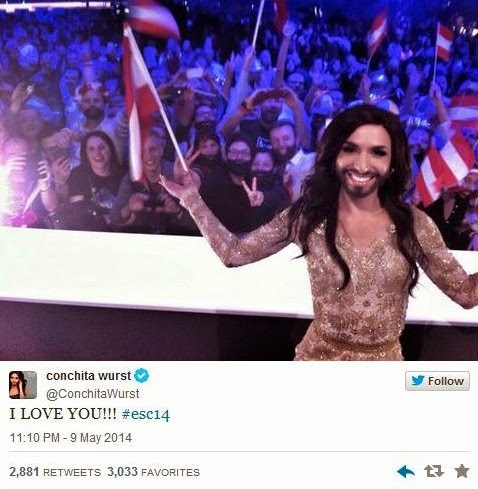 However, there could be just one winner and that was Conchita Wurst from Austria who stormed to victory with 290 points! Austria was followed by The Netherlands and Sweden with 238 and 218 points respectively. Ahead of her victory tonight, we can also reveal that Austria won the second Semi-Final with 169 points and that the Netherlands won the first Semi-Final with 150 points. Denmark and the city of Copenhagen have proven to be worthy hosts of Europe's favourite TV show with a wonderful evening of entertainment put on by host broadcaster Danmarks Radio (DR). The show was opened with a spectacular flag ceremony where the artists entered the arena one by one as their flags were projected onto the giant stage. Tonight, we enjoyed not one, but three interval performances, starting with a look at how the Eurovision Song Contest may look in 2075! This was followed by the three hosts of tonight's show treating us to a video performance of their comical 12 Points Song. Finally, Emmelie de Forest performed her winning song from last year, Only Teardrops, and the official song of this year's competition, Rainmaker, which she also performed together with all 26 finalists! The broadcast was hosted by Pilou Asbæk, Lise Rønne and Nikolaj Koppel who were eager to welcome the millions of viewers to Copenhagen for tonight's show! The final outcome was decided by a 50:50 split between professional juries and televoting from all 37 participants. The jury votes were decided during the Jury Final last night and the televotes decided during tonight's show. The 26 finalists were made up of 20 qualifiers from the first and second Semi-Finals held on the 14th and 16th of May and six automatic qualifiers including the Big 5 countries (France, Germany, Italy, Spain and the United Kingdom) and the host country Denmark.